Let me state this from the start: If you’ve been using Pages ‘09’s more sophisticated page-layout features, Pages version 5.0 for Mac is not the app for you. Pages 5.0 is not an upgrade, it is a brand new application and it is not (yet) the Pages you’ve been waiting for. This may make you sad; everyone wants something shiny and new. But don’t be—Pages ‘09 still works and you can use that for now. Your day is coming, but it’s not today. Now that I’ve gotten that out of the way, let me say this: I like the new Pages and I like it a lot. Not for a massive new set of features. Not because it’s completely stripped down. But because it appears that Apple is setting a foundation for amazing things to come. The newly redesigned user interface changes depending on the type of object you're editing, making for a much cleaner interface. The new Pages is, without question, only related in name to its predecessor. The app’s list of missing features is significant: It has limited page-layout capabilities, no linked text boxes, you can’t customize the toolbar, it has almost no AppleScript support, no style drawer, and lacks file-level compatibility with Pages ‘09. Honestly, the list of what’s missing could go on and on. This makes it a huge disappointment for users who have been happy with Pages and who have developed incredible workflows around the app. Interestingly, the current Pages disappointments mirror what users of AppleWorks were disappointed with when the first version of Pages was released. In fact, in my review of the first release of Pages, what’s notable is how many of the features missing from the original Pages are the same features missing from the new version of Pages. As stripped down as Pages seems, this is no piddly update. Completely rewritten as a 64-bit application, Pages now offers features previously unavailable or even possible. And, take a look around you, it has features unavailable in almost any other word processing application. 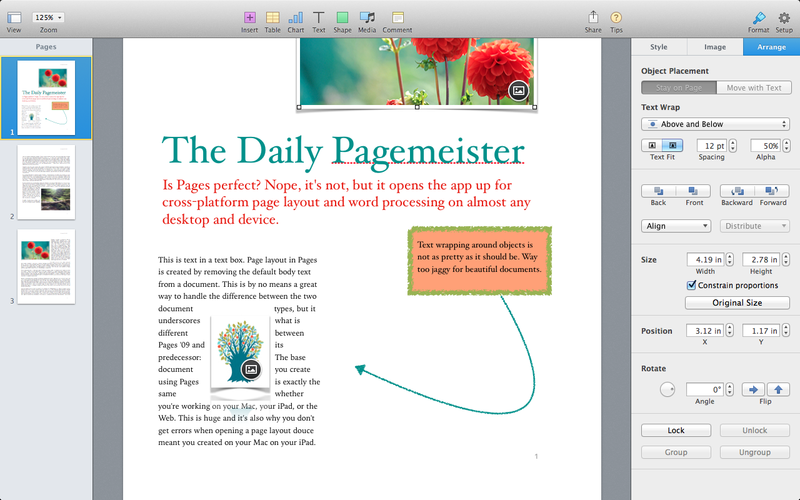 Pages now works and shares files seamlessly with either the Mac or iOS versions of the app. It’s also available to anyone using a modern Web browser, including Windows users who previously had no access to the app (a registered iCloud account is required). Pages also offers real-time collaboration on documents, which in my testing, works amazingly well. The new app lacks Pages '09's standalone page-layout environment, but removing a document's body text gives you similar features with a single document format. Word processing in Pages works as you’d expect it to, although I miss the option of having a formatting menu in the toolbar. Pages lacks the paragraph styles drawer Pages ‘09 had, but I found that changing, adding, and updating paragraph styles was easier and more obvious than it has been in the past. Paragraph styles now appear in the the app’s inspector. When you make a change to a paragraph a small Update button appears allowing you to change the style for all the paragraphs using that style in your document. The app’s new file format is unique in that it doubles as both a traditional word processing and page-layout document. All new blank files behave like traditional word processing documents with standard body text, paragraph styles, embedded graphics, tables, and other objects. But, when you uncheck the Document Body checkbox in the Document Setup tab, you can use the document canvas in the same way you would use a normal page-layout canvas. You can then easily add and rearrange images, text boxes, and other document elements. Pages, however, is missing much of what’s necessary to make it a great, and perhaps even a good page-layout application. You can’t rearrange page order and there is no way to flow text from one text box to another, so the value of what’s being offered is limited. But, and this is a big but, you lose none of these page-layout features when you move the document to your iPhone, iPad, or the Web. 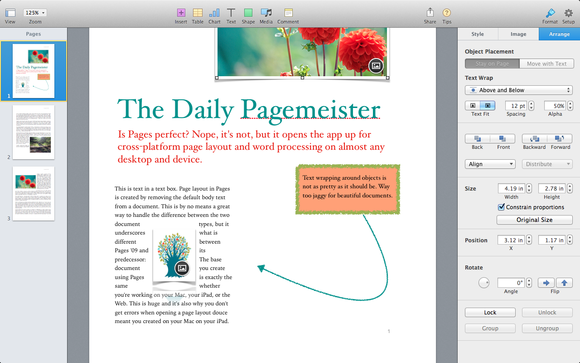 Pages offers a new way of updating styles that is much easier to use than the previous version's style drawer. The app has dispensed with the multiple inspectors that Pages ‘09 used to format virtually every aspect of your document, and it instead uses a new intelligent inspector that changes dynamically depending on what you’re doing. Select an image and the inspector offers tools for editing images. Select text and text editing options appear. Select an object and object editing tools appear. I, for one, prefer this to the Pages ‘09 inspectors. It makes for a much cleaner work environment and I always found that the old inspectors were more in my way than they were useful. One last note: When you download the new Pages from the Mac App Store, it doesn’t replace the old version of Pages. The old version is still on your Mac, but it’s placed in an iWork ‘09 folder inside your Applications folder.